Buddhism came to China during the Eastern or Later Han period. The oldest monastery (siyuan 寺院) on Chinese ground is the White Horse Monastery (Baimasi 白馬寺) in Luoyang. The monastery is not only a place for praying, but also houses - like European monasteries during the Middle Age - dwelling quarters for monks, schools, libraries containing the sutras or holy scriptures of Buddhism, and farm buildings because most monasteries were self-subsistent although believers granted donations to the monks; but the monastery actually had to use these donations not only to built up Buddha statues (Foxiang 佛像) or pagodas (ta 塔, in old times transscribes as futu 浮屠), but also to feed the poor, like Christian monasteries. After Buddhism has become a prevalent religion among all social classes of the Chinese people, the Daoist communities also organized themselves in monasteries. The influence of Hinduism on Buddhism is very deep and can be seen in many aspects of Buddhist thought. One sphere is the cosmic image of Buddhism that believes the center of the cosm being built by a huge mountain called Meru. Mount Kailash in Tibet is thought to be this Mount Meru, the 6714 m high Kangrinboqe. To adopt this cosmic image, some Hinduist rulers in South East Asia (Ankor Vat) saw their temple as center of their own world, the main hall standing on a real or artificial hill. 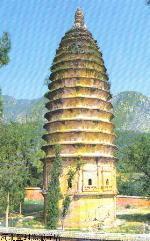 The pagoda can also be seen as a symbol for Mount Meru, the center of the world. Additionally, Mount Meru symbolizes the male phallus (or Sanskrit: lingam), and pagodas therefore have a corresponding shape. By the way, the word "pagoda" derives the Sanskrit word bhagavat (cf. the book Bhagavatgita) "holy". The typical Chinese pagoda like we know it has surfacially nothing in common with the old Indian stupa and seems to be very different the buildings of southern Theravada Buddhism in Sri Lanka (former Ceylon; chedi), Myanmar (former Burma), Thailand, Laos and Cambodia (all three countries adopting the Khmer style prang pagoda). But if we have a nearer look at the shapes and appearances of the Chinese pagodas in earlier ages, we can find traces that can lead back to the Indian origin also of the typical octogonal and straight Chinese pagoda with the curved roofs. The painting to the left reflects a pagoda of Bodhgaya, an important location of Buddhist worship in India, by which we can see some typical features of a pagoda or stupa: The tower is multi-storied and more or less decorated on the surface and tapers bottom to top. The top is crowned with something that looks like a flower bud, in Buddhism an expression for the lotus flower. In other cases, the construction at the top is a honorific umbrella with up to ten layers. Around the main tower we find small miniature pagodas, ranging four to eight, depending on the shape of the whole pagoda complex. 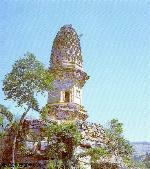 Most pagodas contain relics of the Buddha or at least a statue of the Enlightened. The inside of a pagoda may be a dome-like room or can be climbed by stairs to take care for the decorations or the jewels that are fixed atop of the lotus flower bud. Another example of Non-Chinese Buddhist architecture is the picture to the right, a prang of Ayutthaya (Ayodhya), an old capital of Thailand (former Siam). The oldest pagoda still intact on Chinese soil is the pagoda of Songyue Monastery 嵩嶽寺 of Dengfeng 登封/Henan at the foothills of the sacred mountain Songshan 嵩山. It stands near the famous Shaolin Monastery 少林寺 where monks of the Chan school developed gongfu fighting for mental training. 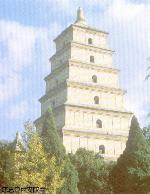 The brick pagoda is 41 m high and was erected in 523 under the patronate of the Northern Wei 北魏rulers. While the lower parts of the round pagoda are built of twelve flat surfaces symbolizing the twelve causes of sin, the upper part is octongonal and constructed in the shape of 15 steps. The top is crowned by a bud that once was adorned with jewels. Not every monastery had enough wealth to built such a huge pagoda. A small octogonal pagoda topped by nine pagodas en miniature the Tang Dynasty 唐 can be found at Lingjiu Mountain 靈鷲山 near the town Liubu 柳埠 at Licheng 歷城/Shandong. The Monastery is called after the pagoda - Nine Pagoda Monastery (Jiutasi 九塔寺). When the city of Chang'an 長安 (modern Xi'an 西安/Shaanxi) was the capital of Tang Dynasty, many emperors and especially empresses worshipped the Buddha and had built some huge pagodas in the state protected monasteries. Two of the Tang Dynasty pagodas are still standing. 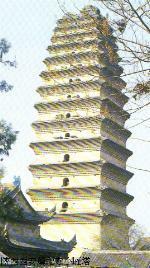 They are called the Great and Small Wild Goose Pagoda. The 64 m high Great Wild Goose Pagoda (Dayanta 大雁塔) was built in 652 in Cien Monastery 慈恩寺, the Small Wild Goose Pagoda (Xiaoyanta 小雁塔; to the right) was erected in 709 in Jianfu Monastery 荐福寺. The Great Wild Goose Pagoda with its step or pyramid shape once served as a treasury for the sutras the monk Xuanzang 玄奘 had brought India. The Cien Monastery was the most important location of Mahayana Buddhism during Tang Dynasty, even monks Japan and Korea came here to study Buddhism. The Small Wild Goose pagode has still the multi-storied curved shapes of the Indian pagoda. It is only 43 m tall because the two upper stories have collapsed. The southern realm of Dali 大理 (region of modern Yunnan) was inhabited by Non-Chinese people that are relatives to the modern Thai and Lao peoples. 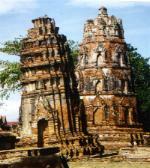 But their religion was clearly influenced by the northern Mahayana Buddhist architecture. The three pagodas were built between the 7th and 10th century and gave the monastery its name: Santasi "Three Pagoda Monastery" 三塔寺. 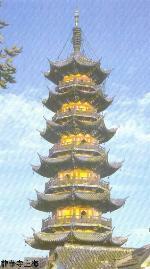 The tallest pagoda, impressive 69 m high, has 18 stories and has a square basis, reducing the size gradually to the top. 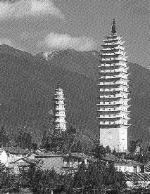 The other two pagodas are octogonal and only 43 m tall (on the picture only one can be seen). Very well preserved, these pagodas can give an impression how the Small Wild Goose Pagoda may have looked when still in use. On the top, we can see the golden construction symbolizing the lotus bud that contains jewels. By the way, pagodas in Myanmar (former Burma) are crowned with the same symbols of Buddhism - although the shape of Burmese pagodas is very different. The timber construction of the pagoda of a small monastery in Yingxian 應縣/Shanxi called Fogong Monastery 佛宮寺 is the oldest pagoda that has the typical shape of Chinese pagodas like we know them. It has five stories and is shaped octogonally. The 67 m tall timber pagoda called "Shakya Timber Pagoda" (Shijia muta 釋迦木塔) was built in 1056 during the reign of the Khitan-Liao Dynasty 遼. Unlike the former brick pagodas, every storey has a gallery outside which the visitor has a brilliant view of monastery and landscape. Also built during the reign of Liao and Jin 金dynasties in north China, the brick Flower Pagoda (Huata 花塔) of Qinghua Monastery 慶華寺 near Laishui 淶水/Hebei has the typical lingam shape of Indian stupas. The lower octogonal part once contained a Buddha statue, the upper dome-like part is decorated on the outside with blind windows. In every window sat a small Buddha statue symbolizing the manifold appearances of the Enlightened. During Song Dynasty 宋 when Kaifeng 開封/Henan served as imperial capital, there was also the need for religious support for the inhabitants of the capital. The so-called Iron Pagoda (Tieta 鐵塔) of the state protected Youguo Monastery 祐國寺 is coated with brown colored tiles, giving the slim building its name. It is 56 m high and has eleven stories upon the basic entrance room. The lotus jewel construction on the top has been destroyed. 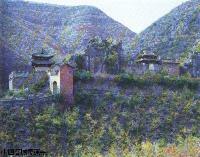 The picture to the right shows the typical Chinese pagoda of our imagination. It is shaped octogonally, painted yellow like the robes of the monks, and has widely curved roofs round each storey, that are almost spiked at the corner of the eight surfaces. The lotus jewel construction on the top is very tall and fastened by iron ropes. This pagoda can be seen in Longhua Monastery 龍華寺 south of Shanghai and was erected during the Song Dynasty, but reconstructed during Qing 清. Similar pagodas can be seen all over the country, e. g. Jiming Monastery 雞鳴寺 in Nanjing 南京/Jiangsu and Liurong Monastery 六榕寺 in Guangzhou 廣州/Guangdong. This 47 m tall pagoda in Suzhou 江蘇/Jiangsu was erected during late Five Dynasties 五代 and early Song in Yunyan Monastery 雲巖寺 on a hill called Tiger Mountain 虎丘. Although built of brick stones, parts of it imitate wood construction. The outer surface of the seven storeys is built quite smooth. The blind windows on the outside once contained Buddha or Bodhisattva statues. 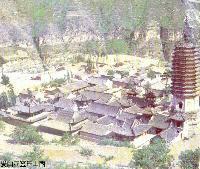 Yunyan Monastery has long been devastated, and only the pagoda is left. Like the tower of Pisa in Italy, the Tiger Hill Pagoda is pending more than 2 m the center of gravity. Some monasteries have erected double pagodas, like the two pagodas with huge top construction of the Luohan Court 羅漢院 in Suzhou. Another example for a double pagoda is Kaiyuan Monastery 開元寺 in Quanzhou 泉州/Fujian (no picture). 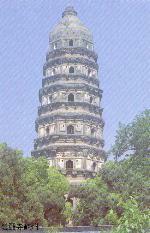 Not every pagoda can be climed like the former examples. The iron pagoda of Yuquan Monastery 玉泉寺 in Dangyang 當陽/Hubei, is slightly pending over its center of gravity (total left). How narrow the interior of a pagoda is, can be seen at the pagoda of Kaiyuan Monastery 開元寺 in Dingxian 定縣/Hebei (left; 1st half 11th cent.). A quarter of the whole tower has been broken off that we can see the "intestines" of the 11 storeys. With 84 m, it is the highest building of Chinese architecture. An overview of a Buddhist monastery's building complex gives the right airview picture of Jueshan Monastery 覺山寺 at Lingqiu 靈丘/Shanxi. While the multi-storied pagoda stands at the southern end of the complex, dwelling quarters, schools and praying halls are enclosed by a wall. The roofs of these buildings are extremely curved and widely overlap the basis of the actual building. In the west and north of China, monasteries are often not incorporated into the scene of a city but stand alone in the wilderness. In Shaanxi, near Datong, a Pending Monastery (Xuankongsi 懸空寺) can be seen where the monks built their dwelling quarters into a mountain wall. Other examples for the solitary monasteries are Yungang 雲崗石窟 near Datong/Shanxi, Maijishan 麥積山 near Tianshui 天水/Gansu, Bingling Monastery 炳靈寺 near Lanzhou 蘭州/Gansu, the grotto monastery Mogaoku 莫高窟 at Dunhuang 敦煌/Gansu, and Fengxian Monastery 奉先寺 with the Longmen Grottoes 龍門石窟 near Luoyang 洛陽/Henan. The picture to the right is an example of a very unknown monastery called Qinglian Monastery 青蓮寺 that lies in a wild montain landscape near Jincheng 晉城/Shanxi. The ruins of this monastery still show the main gate, the wall enclosure and the main prayer hall with a roof that has been reconstructed. Tibet is the center of a special kind of Buddhism, the Lamaism. The Lama as spiritual head of Tibetian Buddhism is at the same time worldly governor of Tibet. Before the Dalai Lama had to leave Tibet, he resided at the Potala Palace (Chinese: Budalagong 布達拉宮) that is erected on the back of a hill north of the city of Lhasa (Chinese: Lasa 拉薩). Another important monastery of Tibet is Shigatse or Xigaze (Chinese: Rikaze 日喀則) where the Panchen Lama resided in the Tashilunpho Monastery (chin. Zhashilunbusi 扎什倫布寺) with its golden roofs. The pagodas of Tibet are much smaller than that of China and are called cherten. 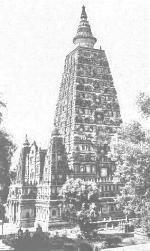 Their shape resembles much more the Indian type chedi and has a globe-like base with a tall, almost phallic lotus jewel construction. A very extraordinary pagoda in China is the Pagoda of the Diamond Cutter Throne 金剛寶座 in Dazhenjue Monastery 大真覺寺 in Beijing. It is erected in the style of an Indian Bihar pagoda that symbolized the dwelling site of the Enlightened in Xumi Mountain 須彌山 (Mount Sumeru or Meru in Hindoo mythology). The square platform is filled up with five almost equally tall pagodas and a porcelain pavillion. This complex was erected in 1473 when the Ming 明 emperors had diplomats and representants of every subject people of their empire resided at Beijing. How huge the honorific umbrella or lotus jewel construction of the top of a pagoda is can be seen at the relics of the gigant pagoda of Todaiji 東大寺 in Nara 奈良/Japan (right picture). The white line in the lower left part of the picture gives the average size of a person. Buddhist architecture is very famous for the pagodas that were built of brick stones that could survive time and erosion. But original wooden buildings are very rare, and most of them can only be seen if they were reconstructed. Most reconstructions were undertaken during Ming and Qing 清 dynasties. A prayer hall that has been preserved in its original Tang Dynasty shape is the main hall of Nanchan Monastery 南禪寺 near the Buddhist mountain Wutaishan 五台山 in Shanxi. Japanese pilgrims were impressed by the Chinese Buddhist architecture, and there is no wonder that Japanese Buddhist halls and pagodas adapted the style of Tang Dynasty architecture, like the huge Todaiji Temple in Nara with its two storey roof (picture to the right). The five sacred mountains of Chinese Buddhism are Wutaishan 五台山 near Datong 大同/Shanxi, Jiuhuashan 九華山 near Tongling 銅陵/Anhui (not far the Huangshan 黃山 Mountain range, famous for its landscape), Putuoshan 普陀山, an island before the cost of Ningbo 寧波/Zhejiang and Emeishan 峨嵋山 in Sichuan. Jing'an Monastery 靜安寺 (Song); the whole building complex was moved its old place near Suzhou River some miles to the south. The library houses old Song time writings. A square pagoda (Fangta 方塔) can be seen in the ruins of a monastery in Songjiang 松江. among the monasteries of the Jiuhuashan Mountain 九華山 are two main complexes, the Huacheng 花城寺 and the Qiyuan 祈園寺 Monasteries the Tang resp. Qing Dynasties. the capital Fuzhou 福州 houses some monasteries, like the Baita Monastery 白塔寺 with a white pagoda (Tang), Hualin Monastery 華林寺 (Tang to Song), Yongquan Monastery 泳泉寺 (Song) on the Gushan Mountain 鼓山, Chongfu Monastery 崇福寺 (late Qing), 零源寺 Lingyuan Monastery on the Beifeng Mountain 北峰山, and the Luoxing Pagoda 羅星塔. the southern city of Xiamen 厦門 has a temple called Nan Putuo Monastery 南普陀寺 (Tang) housing the triad of Buddhas of the past, present and future. the capital Guangzhou (Canton) 廣州 is known for the following monasteries: Guangxiao 光孝寺 (Jin) with two small iron pagodas, Liurong Monastery 六榕寺 (Sui to Tang) with the Huata Pagoda 華塔, Hualin Monastery 華林寺 with the hall of 500 Arhats. 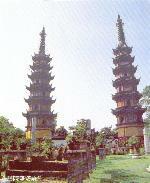 South of Guangzhou, we find the Zhenshan Baota Pagoda 真山寶塔 in Xinhui 新會, and a pagoda in Shunde 順德. near the capital Shijiazhuang 石家莊 is Fuqing Monastery (Sui) in a wonderful landscape. Near Zhengding, we find the Longxing Monastery 隆興寺 (also Sui), and a Pilusi Monastery 毗盧寺. The capital Wuhan 武漢 is an industrial city, but we can find here some monasteries, like the Guiyuan Monastery 歸元寺 with a 500 Arhats Hall, Baotong Monastery 寶通寺 with the Xingfuta Pagoda 興福塔 and Hongshan Baota Pagoda 洪山寶塔 (all Song). The capital Changsha 長沙 can show us Kaifu Monastery 開福寺 (Tang). Tianning Monastery 天寧寺 (Tang) in Changzhou 常州. Jiming Monastery 雞鳴寺 in Nanjing 南京 and Linggu 靈谷寺 and Qixia 栖霞寺 Monasteries nearby. The old city of Suzhou 蘇州 is not only famous for the gardens, but also for pagodas (Beisita 北寺塔, Shuangta 雙塔, Ruiguangta 瑞光塔) and monasteries (Hanshansi 寒山寺, Lingyansi 靈岩寺, Baoshengsi 保聖寺). 揚州 Yangzhou was once a rich city of merchandise and therefore has many pagodas and monasteries, among them Tianning 天寧寺 and Daming Monasteries 大明寺, and Wenfengta Pagoda 文奉塔 and a Stone Pagoda (Shita 石塔). Jinshansi Monastery (Jin) 金山寺 in Zhenjiang 鎮江. Near Xining 西寧 are Wufeng Monastery 五峰寺 and the Monastery Kumbum (chin. Taersi 塔爾寺), one of the most important monasteries of Tibetian Lamaism (Ming). Datong 大同 was once capital of the Northern Wei Dynasty and is crowned with many monasteries, like Shenhua 善化寺 and Huayan 華嚴寺 Monasteries. Near Datong are the famous Yungang Grottoes 雲岡石窟. Guangsheng Monastery 廣勝寺 (Jin to Yuan) in the rather unknown town Hongdong 洪洞. The capital Taiyuan 太原 houses the Chongshan Monastery 崇善寺 (Ming) and a Double Pagoda (Shuangta 雙塔; Tang). Nearby are Longshan Grottoes 龍山石窟 (not the big famous Longshan!) and Tianlongshan 天龍山石窟 Grottoes. Tianning Monastery 天寧寺 (Tang) on Guashan Mountain 卦山. Xuanzhong Monastery 玄中寺 (Tang) near Jiaocheng 交城. Wutaishan Mountain 五台山 is one of the sacred Buddhist mountains with many temples and pagodas. Near the capital Jinan 濟南 is the Thousand Buddha Mountain Qianfoshan 千佛山 with the Xingguo Monastery 興國寺 (Tang). Xi'an 西安 (former Chang'an 長安) was capital for many rulers and dynasties. As capital, many Buddhist monks and Buddhist rulers founded monasteries. The most famous buildings are the Small and Large Wild Goose Pagodas (Xiaoyanta 小雁塔 in Jianfu Monastery 荐福寺, Dayanta 大雁塔 in Cien Monastery 慈恩寺) the Tang Dynasty. Other monasteries are Guangrensi 廣仁寺 (a Qing Dynasty Lama temple), Daxingshansi (Jin Dynasty), Qinglongsi ; near the city are Xingjiaosi 興,教寺, Huayansi 華嚴寺, Xiangjisi and Caotangsi Monasteries. Yan'an 延安 is not only the city where the Communist Party leaders camped during the civil war, but is also known for a Song Dynasty pagoda Yananta 延安塔. The capital Chengdu 成都 is home for three monasteries: Dacisi 大慈寺 (Tang), Zhaojuesi 昭覺寺 (Tang), and Baoguangsi 寶光寺 (Jin). Near the city of Dazu 大足, we find two places of Buddhist grottoes: the Beishan Grottoes 北山石窟, and the Baodingshan Grottoes 寶頂山石窟. Probably the most famous Buddhist mountain is Emeishan 峨眉山 with many monasteries, statues and steles. The huge stone Buddha statue (Dafo 大佛) of Leshan Mountain 樂山 was carved during the Tang Dynasty. 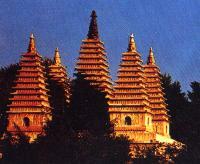 The old kingdom of Dali 大理 was converted to Buddhism and erected three tall pagodas during the Chinese Tang Dynasty. The silk city of Hangzhou 杭州is home of some monasteries, like the Lingyinsi Monastery 靈隱寺 ￿with the large Maitreya potbelly Buddha; further, the Song Dynasty Liuheta Pagoda 六和塔. Ningbo 寧波 is home of Tianfengta Pagoda 天封塔 (Tang), and the monasteries Baoguosi 保國寺 (Song), Tiantongsi 天童寺 (Tang), and Ayuwang Monastery 阿育王寺. The island Putuoshan 普陀山 is one of the sacred Buddhist mountains. The Bodhisattva Guanyin is the main object of reverence on this island. Dashan Monstery 大善寺 (Song Dynasty) in Shaoxing 紹興. The Tiantai school was founded in the monasteries of Mount Tiantai 天台山. Lingfeng and 靈峰寺 Lingyan Monasteries 靈岩寺 (both Ming) are Buddhist complexes of the Yandangshan Mountains 雁蕩山. Jokhang Monastery (Chinese: Dazhaosi 大昭寺), Ramoche Monastery (Chinese: Xiaozhaosi 小昭寺) and the Potala (Chinese: Budalagong 布達拉宮) in Lhasa (Chinese: Lasa 拉薩). Near Lhasa are the monasteries Drepung (Chinese: Zhefengsi 哲蜂寺), Nechung (Chinese: Shenyusi 神諭寺), Sera (Chinese: Selasi 色拉寺), Ganden (Chinese: Gandansi 甘丹寺), and Nethang (Chinese: Nietangsi 聶唐寺). Wuta Monastery 五塔寺 and and Lama Temple Dazhao 大召 in Hohhot (chin. Huhehaote 呼和浩特). Nearby the White Pagoda (Baita 白塔) and the Huayan Pagoda 華嚴經塔. Hong Kong is more famous as a market place than a cultural heritage. Nontheless, tourists can find here a Ten Thousand Buddha Monastery 萬佛寺 (cant. Maahnfahtji) in the New Territories, and Po Lin Monastery on the island of Lantao (cant. Daaihyuhsaan 大嶼山) with the largest bronze Buddha of the world. The only noteworthy place of Buddhist worship in Taiwan (although there are small temples in every town) is Foguangshan Mountain 佛光山 near Gaoxiong 高雄, with a huge bronze Buddha, erected in 1967.